Modern drives do not only match requirements when it comes to performance strength, reliability and precision, they also fulfil expectations of efficiency and economy. 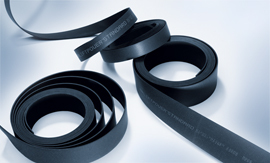 With our flat belts made out of polyurethane and neoprene, Walther Flender is able to offer you a cost-conscious alternative to chains, steel ropes and hydraulic cylinders. This alternative is particularly special due to its small pulley diameters and thus low space requirements, its high power transfer and its high degree of flexibility. 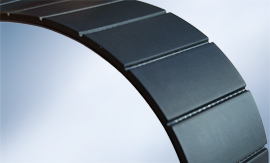 We can offer you various versions and various widths of the flat belts, and of course they come with pulleys that are perfectly matched to the pulleys.